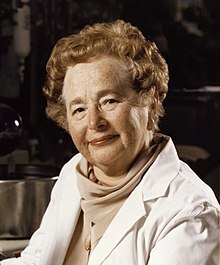 Gertrude Belle Elion (January 23, 1918 – February 21, 1999) was an American biochemist and pharmacologist, who shared the 1988 Nobel Prize in Physiology or Medicine with George H. Hitchings and Sir James Black. Working alone as well as with Hitchings and Black, Elion developed a multitude of new drugs, using innovative research methods that would later lead to the development of the AIDS drug AZT. She developed the first immunosuppressive drug, azathioprine, used for organ transplants. People ask me often (was) the Nobel Prize the thing you were aiming for all your life? And I say that would be crazy. Nobody would aim for a Nobel Prize because, if you didn’t get it, your whole life would be wasted. What we were aiming at was getting people well, and the satisfaction of that is much greater than any prize you can get. This page was last edited on 5 September 2018, at 19:49.